Now that the weather's getting warmer, I've began to change up my skincare routine. Slowly taking out products suited for the colder months and adding in products better for the warmer months. One of the many changes will be the moisturizer, as I generally prefer a lighter moisturizer that hydrating but not too rich in the warmer months. Although, I do have a favorite, I wanted to try a few things in my stash and one of them was this Skinfood Facial Water Vita-C Cream. 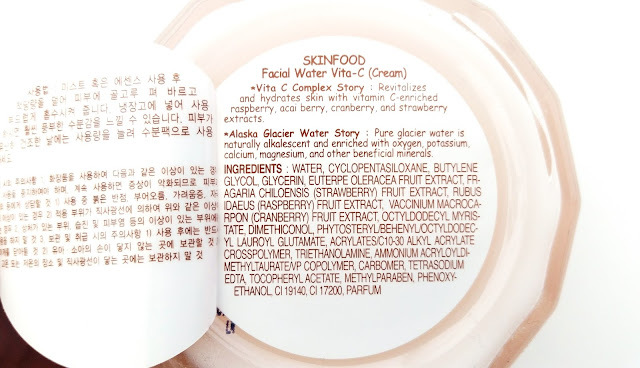 Product Description: The Skinfood Facial Water Vita-C Cream is a facial cream that works to moisturize the skin with their Vita C complex and Alaskan glacier water. The Vita C complex includes berry extracts that are rich in vitamin C such as raspberry, acai berry, cranberry, and strawberry. The other moisturizing ingredient is Alaskan glacier water which is rich in minerals, ions, and more. 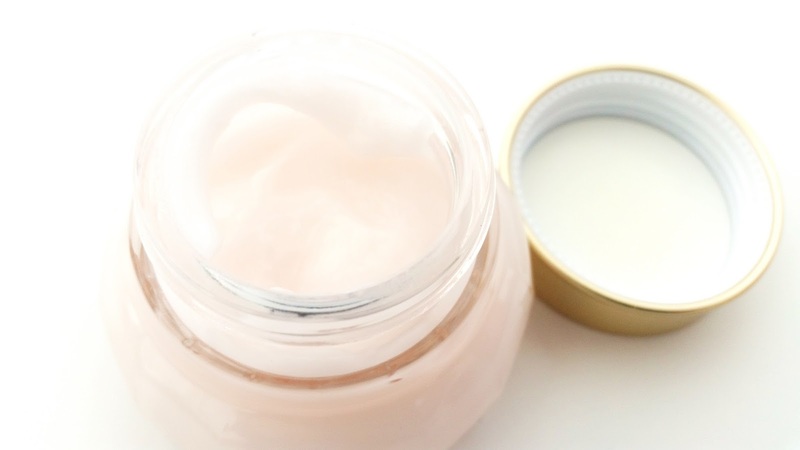 To Use: Apply an ample amount of the moisturizer onto the face. Gently pat in the cream until it's fully absorbed. You may refrigerate the product before use to enjoy it as a cooling skin treatment. 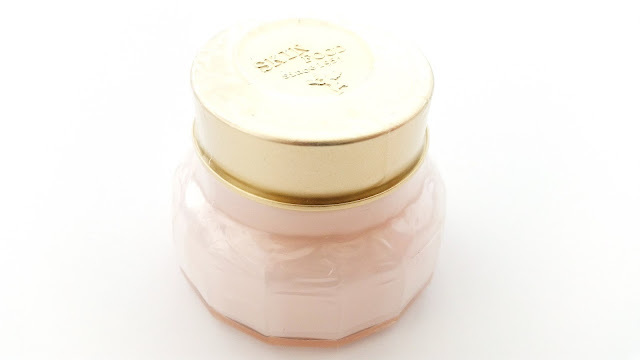 This facial cream can also double as a hydrating mask pack by simply applying a more liberal layer. Ingredients: Water, cyclopentasiloxane, butylene glucol, glycerin, euterpe oleracea fruit extract, fragaria chiloensis (strawberry) fruit extract, rubusidaeus (raspberry) fruit extract, vaccinum macrocarpon (cranberry) fruit extract, octyldodecyl myristate, dimthiconol, phytosteryl/behenyloctyldodecyl lauroyl glutamate, acrylates/C10-30 alkyl acrylate crosspolymer, triethanolamine, ammonium acryloyldimethyltaurate/VP copolymer, carbomer, tetrasodium EDTA, tocopheryl acetate, methylparaben, phenoxyethanol, CI 19140, CI 17200, Parfum. Packaging: The Vita-C cream comes in a see-through glass jar container with a twist-off lid. On the bottom of the container, you can find product description and full ingredient list, as well as the product's manufacturing & expiration date. 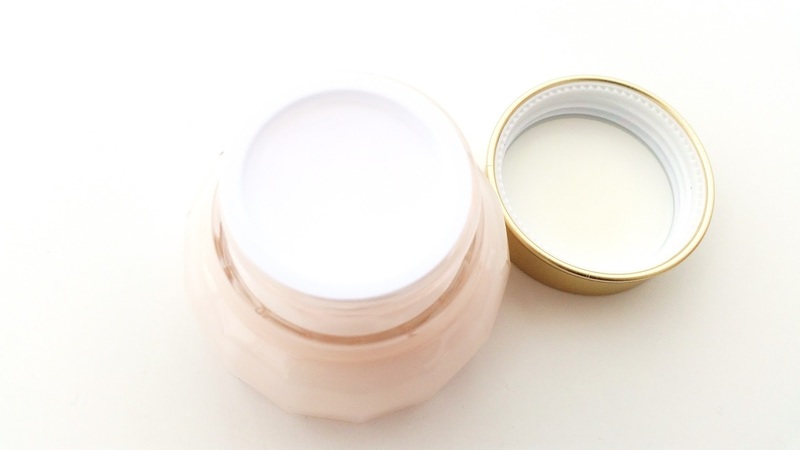 Inside the container, there's a plastic lid, removing that will reveal the facial cream. A paper packaging also comes with the product and it contains information regarding how one should use the product. Note: The product should come with a plastic seal wrap, as seen in the first picture. This ensures that the product hasn't been opened by anyone else. 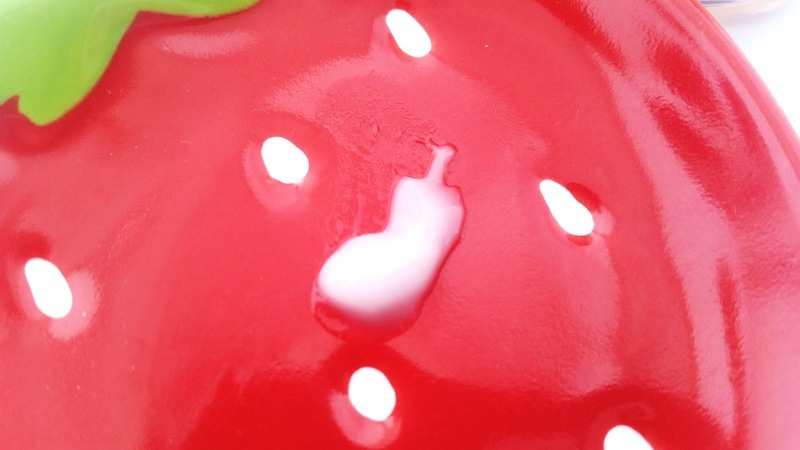 Scent: Despite the berry ingredients in this facial cream, it doesn't smell like berries at all. Instead, it has a sweet floral perfume scent. Additional fragrance has been added to this product. Color: The cream is mostly opaque white in color with just a hint of pink. Texture: The consistency of this cream is like a watery cream. It's light and spreads easily, turning almost into a water like state making it easy to absorb. This cream is lightweight, almost like a gel cream but without the gel consistency. Michelle's Thoughts: I started to test this cream about 2 months ago in preparation for the spring season. I have my HG winter moisturizer but in warmer months, I usually use moisturizers that are lighter but still hydrating yet not too rich. So I was working on switching to these lighter moisturizers. I found the Skinfood Facial Water Vita-C Cream in my stash and figured I'd give it a shot. I have been using this cream on and off for the past 2 months and for me it's just a decent moisturizer with no Wow factor. This is a moisturizer that would just come and go in my books. There's nothing really special about it that reels in me and makes me want to repurchase it. It has some pros and some cons, it's not perfect but not the worst. For me, the pros of this product are its nourishing ingredients, easy to absorb formula and its inexpensive price. Although the nourishment a product provides aren't always a noticeable skincare effect, it's still nice to know that the product contains these nourishing extracts. I like that the formula is easy to use and absorbs quickly. It doesn't leave behind any sticky residues and you can layer it without it feeling heavy on the skin. The inexpensive price is great for those shopping on a budget or those new to K-beauty and doesn't want to shell out a ton of money for their first haul. Although the Vita-C cream is suggested for normal skin/all skin types, I don't think it's moisturizing enough for some skin types. I have combo to oily skin type and I find it's not hydrating enough for the combo parts of my skin for the current spring weather. I have to layer the product to get the right hydrating amount. The moisturizer is better for my T-zone area where it's oily as it provides good hydration without causing the T-zone to be even more oilier. I think this moisturizer would work best for people with oily skin types. For people with combination or dry skin types, this might not be hydrating enough. As a reference, my mom has normal skin type and she doesn't think this moisturizer is hydrating enough for her skin now either. Hopefully, when the summer comes this moisturizer will be better suited for my skin. Another flaw for this product is its scent. It's a bit too strong for my taste. The floral scent isn't bad once it lightens. However, upon application the scent is pretty strong and takes some time to dissipate. If you are sensitive to scents, you might not like this product. Final Thoughts: I think the easiest way to explain my thoughts on this product is that it's not my cup of tea. This moisturizer has a few good points but also a few flaws that can't be over looked either. It's a good beginner K-beauty product and great for those on a budget. However, if you are willing to spend a little more, there are plenty of other moisturizers that are worth a look. Would I repurchase it in the future? No. While it's great to test out this Vita-C cream and I will finish my jar, I won't be buying it again. There are other moisturizers I want to try and this one just didn't stand out for me. Do I think this is worth a try? Honestly, not really. Maybe only if you are on a really tight budget and need a moisturizer to hold you over until you have more money. Otherwise, there are plenty of other moisturizers on the market. 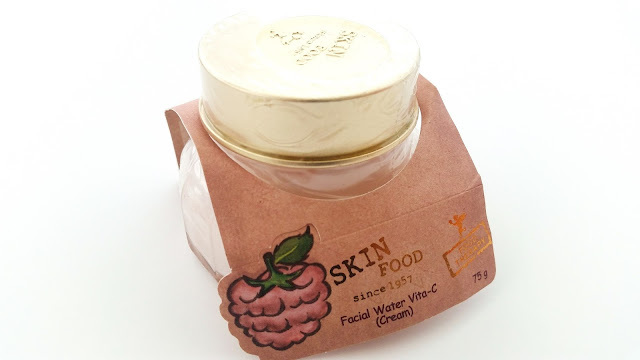 Have you tried this moisturizer from Skinfood? What are your thoughts on it? Let me know in the comments below! Find the latest discount codes on our deals and steals page! Disclaimer: This product was purchased by me. All opinions are honest and my own. This post contains some affiliate links, for more information check out the full disclaimer.